The Lenovo 3000-N100 (£399 inc VAT) is an impressive and imposing machine. Weighing in at 2.8kg, it comes with a 15.4-inch screen size, which looks bigger due to the thicker bezel and protection around the panel itself. Made from thick plastic, there is very little bend or flex to this machine and we found that while the weight is less than ideal for the regular commute, if you need to carry it around, it'll certainly stand up to it. With a battery life, under test, of 151 minutes from a single charge, it won't keep you mobile all day, but it's enough to see you through lectures or a typical office meeting. Open the lid and you'll find the screen has a standard TFT coating. While we were impressed with the quality of the Toshiba's display, this is far brighter, with crisper images and better overall tone. Graphics are handled by an Intel integrated GPU chip, so you'll be able to run basic tasks or watch DVD movies, but you won't be able to run anything too labour-intensive. What really makes this laptop great for the price is the keyboard. Sitting squarely in the middle of the main board, the keys are extremely well mounted and have an effortless action as you type. The touchpad and mouse buttons have the same degree of quality with their small size being the only weak point. It runs Windows XP instead of the new Vista OS, and we found the machine loaded quickly. If your needs are fairly basic, there is no real need to opt for the more resource-heavy OS, as the entry level specification of the Lenovo isn't optimised to make the most of it. 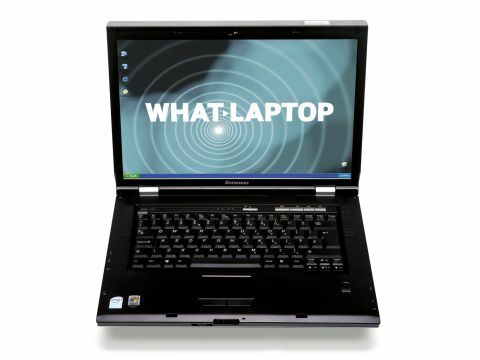 Along with Windows XP, you'll find an Intel Celeron M budget processor, which is once again fine for everyday tasks. As long as you don't try to run anything too labour-intensive, such as editing hours of video, you'll find it will serve you well. At such an entry level price, it would be easy not to expect little touches to make life easier. However, you'll find a hardware button that is linked to the Lenovo Care Centre. This is a neat utility that helps you manage everything from setting up and maintaining your laptop's wireless connection, to updating the drivers and even rolling back the OS should anything go wrong. This is a great utility and adds to the overall value at no extra cost. Simply looking at the specification list, it would be easy to dismiss the Lenovo 3000-N100 as a cheap and cheerful laptop. However, we found it to be a highly competent and robust machine that anyone with everyday needs will find a great laptop to use.